We keep getting more and more points of affirmation that location targeting in mobile is growing. This is happening as both large advertisers “grow into” the medium, and as it moves down market to SMBs (whose mobile advertising is counted as 100 percent local). Usage is there: Google last May announced 40 percent of mobile searches are local (and again in last quarterly earnings). And the ad networks we talk to confirm that they’re seeing premiums on location targeted ads — premiums that result from higher performance. As we “unpacked” in a previous blog post, all these factors and more go into our equation that projects rather steep growth in local’s share of mobile ad dollars. According to our forecast out this week, it’s pegged at about 69 percent of mobile ad spending by 2015 (currently about 50 percent). Top-tier mobile ad network Millennial Media is out today with more data that support growth in location targeted mobile ads. According to the simple math I did from data revealed in the “SMART” report, 29 percent of mobile campaigns are targeted locally. 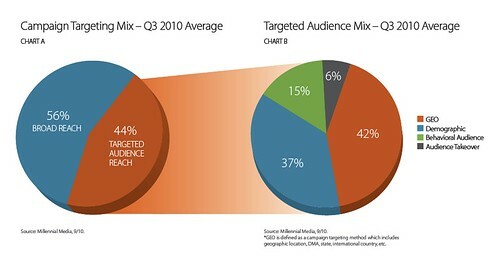 This was derived from 45 percent of campaigns being targeted, with 66 percent of those using geo (see below). But more important, if you measure this against the 19 percent share the firm calculated in last year‘s Q3 report, this represents a 53 percent increase. Of course a lot of this comes down to definitions of local targeting (a whole different post). And the standard disclaimer for mobile ad network data applies: It’s just one network, but relevant in its large sample and directional relevance for the same data points year over year. We’ll have lots more commentary on this subject when our mobile forecast publishes this week.